So I have this scheme to come up with an inline packet sniffer that can be ruggedized, and dropped in place anywhere and just work. Since the advent of switches, it has become quite a bit more difficult to drop a tee on a deeply embedded network for debugging. The solution usually involves either a ghetto 10/100 hub (which sends each packet out all ports), a switch with port mirroring($$$), or a linux rig with iptables(lots of config time). None of those solutions are really ideal. So, what I really want is something I can just plug in between 2 nodes on the network and get a copy of everything, and optionally tee it off to another computer. Everything should be preconfigured to work, so no blowing yet another evening configuring iptables. The gumstix Tobi DUO seemed to be a potential solution. And, if not a solution, a cool toy at the least. So no matter which way it ends up, it’s a win. Navigating the morass of Gumstix products took quite awhile. I eventually settled on the IronSTORM because it had extended range components, which seemed better suited to the ruggedized device I eventually wanted. It also has wifi and bluetooth capability, which I initially disliked, but am coming around, as it supports the network tee requirement nicely. It has an OpenGL graphics accelerator, which just seems really odd to me to have on such a device, but ok, and it has a DSP, which is pretty neat, although I don’t plan to use it for anything, yet. So I ordered the Overo IronSTORM COM plus the Tobi Duo, which has dual network interfaces, and was stoked when I got my new gumstix in the mail last week. This was just in time for supplying some nerd fun over the long memorial day weekend, but lo! I discovered there’s no serial console on the Duo. The documentation suggest that I should order the Tobi expansion board, as that has a usb serial console, and can be used for image update and debugging. The COM does have serial console coming out of J1 (pin 31 and 26), but it’s buried when connected to the Duo, and I suspect is used for something. Using bluetooth for console after kernel boot is an option, but I don’t have bluetooth. Headscratching ensued, but a solution soon emerged. Connect one of the ports of the Duo into your LAN. 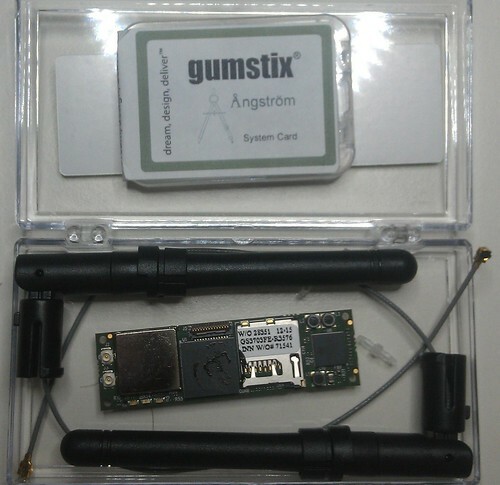 I would like to see the gumstix come with a quick start guide for the Duo that has just that information.